I dream. I'm elated when they come true, and I'm disappointed when they don't. Well, I'm the only one getting affected by it. Who else is gonna be aware of what I want? Sitting back and looking at life, I realise that each one is all alone. We come alone and we go alone. And the journey in between is also meant to be spent alone. Whoever said 'Each one to its own' is so damn right. Life's been good these days. Well, there has been a few glitches here and there, but life has kinda been stable. I've learnt to accept things and I've learnt that that's the only way and the best way you can deal with things. Again its something that I've learnt, but noone will understand why I am, the way I am. That's all well within me. I have a great bunch of friends and a lot of people in my life. I know the ones who love me, the one who don't, the ones who pretend to and the ones who pretend not to. Friends are the best form of distraction life can give. I go out with them, have loads of fun but at the end of the day I come back to my room and am left to deal with the inner demons all alone. That's life. No matter whom you have, how many you have, at the end of the day you are just with yourself. Why do I write? Its only because I want to. I write what I feel like at that point of time. My poems are mostly about love and life. My love and my life. So if I don't write about it, who else will. I don't know how many of them actually read what I write, but I feel better once I see what I feel in words. That's all that matters to me. I'm usually a very happy person, but some of the people 'think' that I'm not. They think I'm sad and lonely and am just not able to move on in life. I've changed from the weepy girl I was a year ago, to a mature understanding woman. If this is not moving on, then what else is? If moving on means, jumping into the arms of the next guy I find, I refuse to move on. Its my life and I know what I want from it. People might hate me for the way I am, but I'm still me and that's what matters. They say that the first cut is always the deepest. Only I know it, for it penetrated my skin. Well life moves on. Time doesn't heal anything, it only gives us the strength to handle it or makes us get used to it. Good or bad, you have to deal with it. People can only give an opinion, but what you do is entirely your choice. I think pain is inevitable, but suffering is optional. Every step in life is a reality check, and the only way you can actually learn things is the hard way. At every step you surely will have people around you, but you need to figure out the next step you want to take. I may crib about being a techie today, but when I had the choice to choose what I want, I chose this and that's why I am here today. Had I wanted to pursue journalism or psychology I should have chosen it that time. But I dint. Each one pays for the choices they make in life and it affects only one person, YOU. 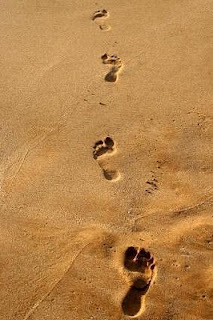 When I look back at the sands of time, I only see a single set of footsteps. Mine. These are the steps from every part of my life, where I walked alone. on a serious note though, you definitely got the 'gist' of life, spot on! no matter what, at the end of it all, we are ALONE. Correction first.. I'm not sad and lonely! 'Some' people think that.